From 23-25 November 2016 a delegation of young scientists from universities of the Russian Federation visited IIASA. 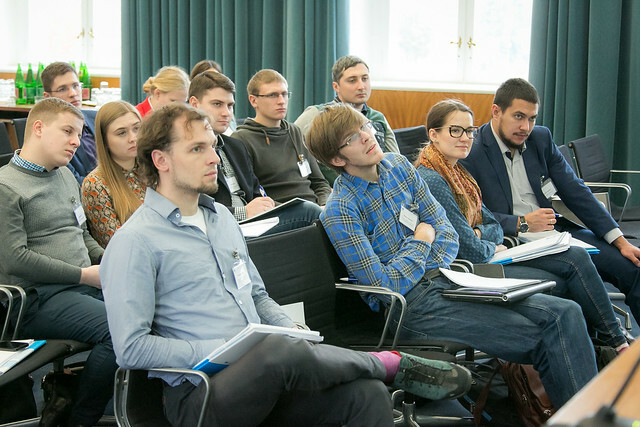 The visit was jointly organized by IIASA, the Russian Academy of Sciences and the Ministry of Education and Science of the Russian Federation, with the aim of increasing the number of young Russian scientists involved in IIASA activities. The delegation, which was formed of scientists from universities across the Russian Federation, was introduced to applied systems analysis, IIASA, its history, current research agenda, systems methods and science-policy activities. During the visit, the participants had a chance to discuss their planned research with selected IIASA scientists and discuss further areas of possible mutual collaboration. Since 2008 IIASA has intensified its collaborations with the Russian Federation (Russia), leading to new joint research projects, increased interactions with Russian policymakers, significant scientific exchange through people, and a highly productive publication record. Current projects include exploring the challenges and opportunities of Eurasian economic integration, how to minimize wildfires, population aging in Russia, and advancing the methods of systems analysis. Interactions now take place regularly between IIASA and representatives from Russian Ministries and the Administration of the President of the Russian Federation. Knowledge transfer between IIASA and Russia is also facilitated through multiple exchanges with Russian scientists who spend periods working in IIASA’s international and interdisciplinary research environment. The scientific output from these numerous formal and informal activities is highly productive, with over 430 joint publications since 2008.